Carol Ashton (nee Decker) passed away peacefully on Tuesday, November 13, 2018 in Brick, New Jersey at the age of 75. Born in Staten Island, NY, she was the daughter of the late Walter and Margaret Decker. A graduate of St. Peter’s Girls High School, Carol married Richard Ashton and had 3 adoring children. Carol was an active parishioner and a member of the Mother’s Guild at Blessed Sacrament R.C. Church. She was an avid Yankees fan and a season ticket holder to the NY Giants. She enjoyed the Jersey shore, where she eventually retired and entertained the masses who loved to visit as much as she loved having them. Most importantly, she was happiest spending time with her cherished family, showering them with tremendous love and care. 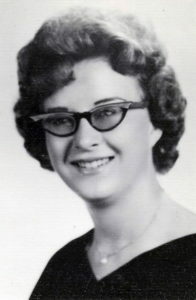 She is survived by her husband, Richard; her daughter, Helen (Ronald) Riccardi; her sons Kevin Ashton (David Marshall) and Brian (Victoria) Ashton; eight grandchildren: Paul, Patrick, Alanna, Kelly, Christopher, Matthew, Craig and Grant; a great-grandchild, Brayden; her brothers Robert and Thomas; she was predeceased by her brother, Richard Decker; she is also survived by her aunt, Helen Rooney; and an extended family of cousins, nieces and nephews. They were all blessed to have known her. In Lieu of flowers, donations to the American Cancer Society would be greatly appreciated. Funeral to be held at Cherubini McInerney Funeral Home on Saturday at 9:30am with a mass at Blessed Sacrament RC Church at 10:00am. Family and friends are invited for viewing on Friday from 2-4pm and 7-9pm. your loving memories of her will give you some comfort during this time of sorrow. so that you will be able to cope with your loss.